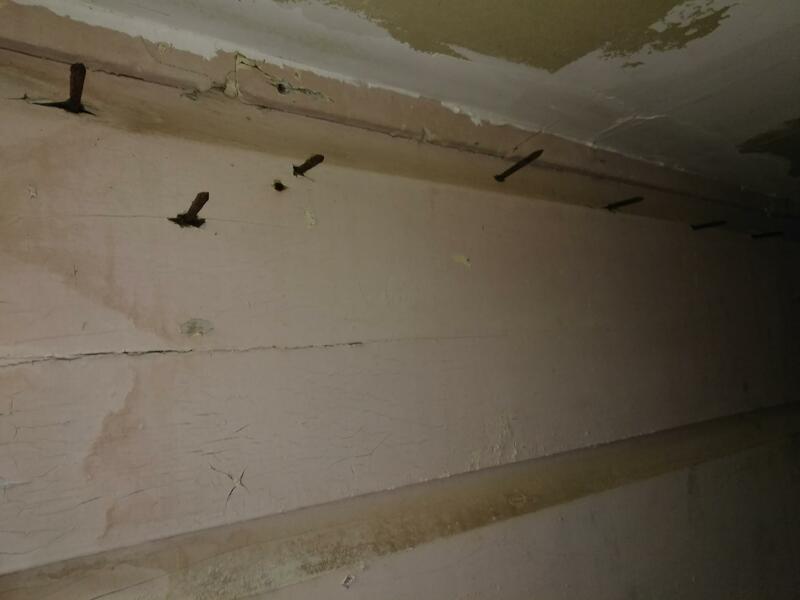 I noticed several nails sticking out from the neighbors wall. It's in the trade alley. The house is a rental and I have yet to get in contact with the owner. 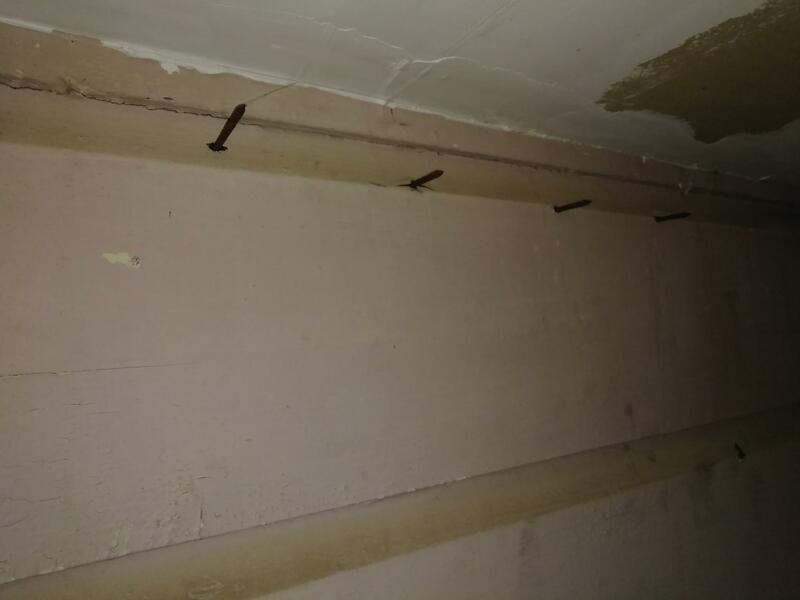 The renters don't want me to push the nails back. I'm thinking it might be easiest to cut the nails. Rental: Do not touch it. Alert the owner, tell them that this a safety hazard, someone can get cut, pierced of maimed by them. I am a BTK AMPUTEE, because I stepped on a nail. Got gangrene, and had to have my foot and 10" of my leg removed to stop it from spreading. Protruding nails are a danger. And the owner of this property is responsible for all concerned persons safety. 123pugsy, lenaitch, Yodaman and 1 others like this. Yup, not your property. Get the tenants to contact the property owner. If it was my place to worry about, a set of lineman's pliers and a good grip would do the trick or a nail cutter (don't know how common they are now - farriers use them). Hmm, image doesn't seem to be showing. If this a shared causeway, and you use it, you have the right to contact the landlord yourself. I would cut them off with a side cutter tool. Used to snip wiring of all kinds. Does the building have a maintenance person or handyman they use regularly? You could talk to them so next time they are in the area they just snip them. Not sure if you are allowed or not, but to cut them flush get a 9 inch flexible metal cutting blade on a sawzall. You can bend the blade as you are cutting such that it rides along the wood. That will give you a flush cut. I guess you could also use the blade from a hacksaw to do the same thing. I agree with contacting the landlord first. That aside, I cut nails like this with a small right angle grinder with a thin cut off wheel. It trims flush and removes the burr too. Bondo and dd57chevy like this. MTN REMODEL LLC, Yodaman and dd57chevy like this. My variable speed DREMEL with the Cutoff Wheel, would cut very well also. If you touch it, you assume responsibility and associated liability. Notify the landlord and owner in writing. de-nagorg and dd57chevy like this. de-nagorg and Domo like this. or a nail cutter (don't know how common they are now - farriers use them). They are still available. They are sold under various names, hoof nipper, shoe puller, end cutting nipper, farrier pliers, horse shoeing pliers, etc. They are also great for pulling headless nails, once you develope a touch for it. When you first try it, you often clip the nail rather than pulling it. A remedy for the accidental clipping of the nail. Get a triangle file, use it on the center of the cutting heads, to make matching V notches. not too deep, just enough. This creates a great puller of headless nails, as well as ones that have broken off or the head has came off. Simplest approach is to take a hammer and bend the nails down and flatten them against the wall. It would take less than 5 minutes. If you have a grinder or cut-of tool then a cutting wheel would cut the nails off flush. Last edited by Calson; 04-10-2019 at 05:43 PM.